St. Albans Cakes- are there too many bakers? So after setting up The Boutique Cake Company a few weeks ago, I've discovered that LOTS of people like baking and decorating in St. Albans and Herts. I've also discovered that LOTS of people like eating cake. So what sets The Boutique Cake Company apart from the rest? 1) Each cake is individually designed and made based on your requirements, resulting in not only scrummy, but truly bespoke and beautiful cakes. 2) Each delicious recipe has been tried and tested by me, my husband, and my lucky friends on numerous occasions. Perhaps more than entirely necessary, but who would say no to eating a 'test cake'? 3) Allergy-free cakes can be made on request- I'm happy to try anything out (see point above)! 4) I have to admit that I've seen some dubious cakes since checking out some of the local competition but have also seen some quite amazing creations, which spurs me on even more to be the BEST. I have been told by some of my customers that my attention to detail is unlike any other in St. Albans. I strive to make things look as lifelike as possible (see my 'pizza cake' in my 'celebration cakes' gallery) and especially enjoy making cakes look like food items. 5) Cake makes me smile 😄, which in turn makes my customers smile. So why go anywhere else? The Boutique Cake Company will knock your cakey socks off. If cakes wore socks. 'Show stopper' cake for novice bakers! I was recently asked by two different friends to help them bake and ice a 'show stopper' cake for competitions or to wow their work colleagues, however I wasn't available to be there in person (and obviously it would have been cheating if I'd helped, I'm not known as 'Square-Bear' Becky for nothing!!). Therefore I sent them my tried and tested foolproof sponge recipe (or maybe not for one of them, but we later deduced it was down to a mental hot oven that the parents swore blind was working), and step by step instructions to create a simple but beautiful cake. If they can do it, so can you, so why don't you give it a go (and save me a piece)?! 1 punnet of raspberries, and some other berries like blueberries. Preheat oven to 180*C (160 if fan). Butter and line 2x 8inch (20cm) cake pans with grease proof paper. Mix all the ingredients (ideally with an electric mixer or food processor) until light brown and really fluffy. Split the mixture between 2 tins and flatten out. Cook for about 25 mins or until the top is springy and a skewer comes out clean. Allow to cool on a wire rack and remove the paper. Melt the choc in a bowl over just-boiling water, or in the microwave (30 second intervals). Allow to cool for a few mins. In a separate bowl, mix the butter, milk, vanilla and icing sugar until smooth (may take 5 mins with an electric mixer). Add the melted chocolate and mix for a further few mins. This can be stored in the fridge for up to a week, and taken out about 1-2 hours before icing the cake. Once the cakes are completely cool, if there is a large dome on the cakes, use a large knife to slide off some of the dome from both so that the cake is more stable. Put a layer of the icing onto the bottom tier and place the top tier on top. Put a layer of icing all round the sides and on the top (this doesn't have to be tidy). Push the choc fingers lightly into the side of the cake. Pour a layer of mixed fruit onto the top to cover all the icing. Ta-da!! One of the cakes won 3rd prize- can you guess which?! 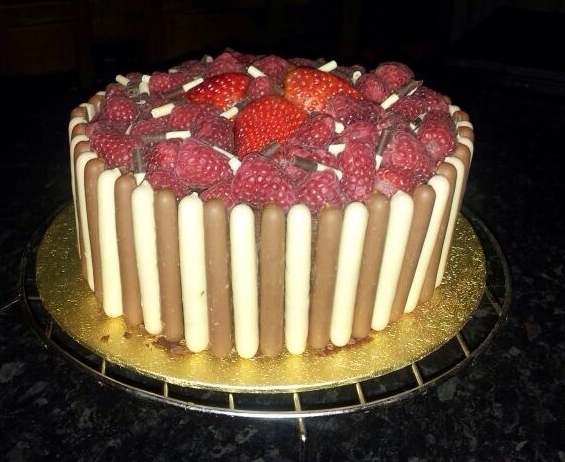 Welcome to the Boutique Cake Company blog/info page/recipes/links to things I like. I’ll literally post anything cake-related here that may have made me smile, drool, gasp or that I think may interest other people. Feel free to make suggestions via the ‘contact’ page, and I’ll try to include it in my next post.